Fès is the “symbolic heart” of Morocco – its intellectual, historical and spiritual capital. As you wander through its labyrinthine shady streets, exotic smells of mint and spices waft through the air, dappled light falls on the whitewashed, crumbing grandeur of the old city and you can feel the tangible mystery and intrigue of this, the oldest of the four imperial cities. Unlike many walled cities, Old Fès hasn’t burst its banks, and its gates and walls remain intact. The population expanded out of the city, flowing towards the south-west and arching towards the hillsides that stretch north and south of the new city. The towering Medesa Bou Inania, a theological college built in 1350, dominates the old city in the Fez River‘s fertile basin. 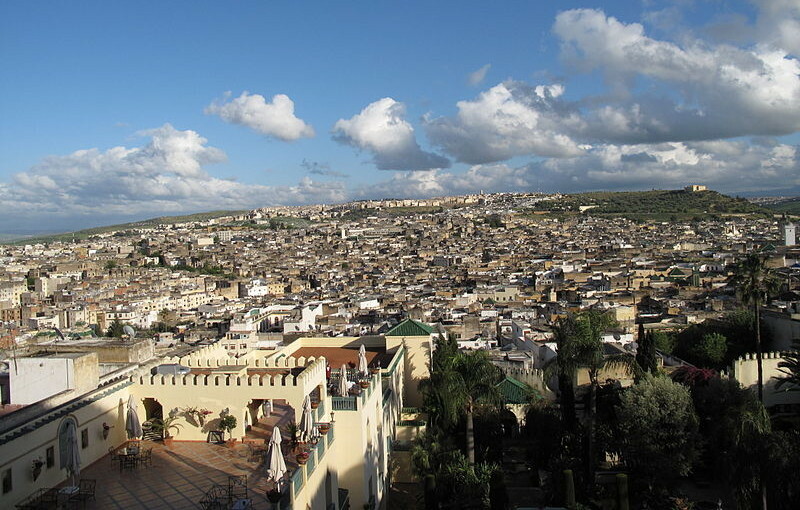 The medina of Fès el-Bali (Old Fès) is one of the largest living and working medieval cities in the world. Consisting of the “traditional seven elements”, mosques, medersas, a hammam (steam bath) and the bakery, it is a bustling combination of city, museum and workshop that has changed very little with the passing of time. The streets are filled with artisans creating and selling their wares using traditional techniques. You can see baby-soft leathers being tanned, the sun glinting off copper pots as they are being soldered, brass plates being engraved, colorful ceramics and embroidery, cedar, woodwork and carpets being hawked in hoarse voices that echo in the many courtyards. One of the experiences that cannot be missed is a stop into a Moroccan carpet shop. There you will be plied with mint tea and shown hundreds of stunning, intricately woven rugs selling for a fraction of the price that you would pay in a department store for one of inferior quality. Some visitors may feel intimidated, but if you are looking for a quality carpet, and you enjoy bartering – this will be an unforgettable treat! Harira, a hearty bean-based soup with vegetables and meat as well as Tagines, stewed vegetables, meat or fish cooked in earthernwave cones, and cous cous. For the adventurous Pastilla de pigeon – pigeon meat, topped with scrambled eggs, then filo pastry, sugar and cinnamon. Meknes, the Moroccan Versailles, surrounded by 40 km (25 mi) lime and earth walls. Leather goods, ceramics, spices and carpets. June to September on the Atlantic – Mediterranean coastline. March to June and September to December for the central plateau.